And it’s over. The summer and the #usedtobeatablecloth challenge too. Hopefully some of you have found inspiration here in the past few weeks, and there are tablecloths out there turned into something wearable and cherished. 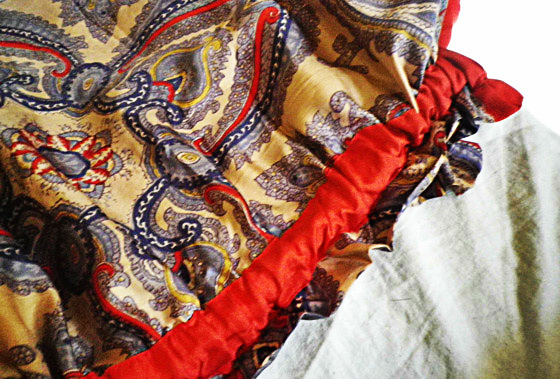 Two sewing friends definitely did, and turned their charity shop finds into some beautiful pieces of clothing. Marijana, from Sew2Pro, found a very similar tablecloth to what I made my Little White Dress from. She decided to dye it to indigo and made a spaghetti strap summer dress. I really love the placement of the lace details and the interesting neckline, and as far as I know there is some leftover fabric, so watch that space! Kaci, from Textile and Stitch, bought this crochet tablecloth for a mere $1 and turned it into something Anthropologie would sell for about 200 times more. 🙂 I think it’s super difficult to find anything crocheted that doesn’t look too cute or granny like, but with the simple design and it being monochrome, she managed to pick something that goes very well with a contemporary outfit. It might just be my laziness, but I always love a nice use of the border for the hems, and the ones on this jacket look absolutely perfect. We went to my favourite park to have a picnic and take some photos (thank you Robbie! ), and I think I got a bit more comfortable than I was supposed to in this kind of dress, so I had to pull the dress up a few times… I am now thinking of inserting boning into the sides and maybe even into the front seam lines, but it’s not high on my list of priorities at the moment. I already went into detail about how this dress came together, so I will not bore you with that anymore. 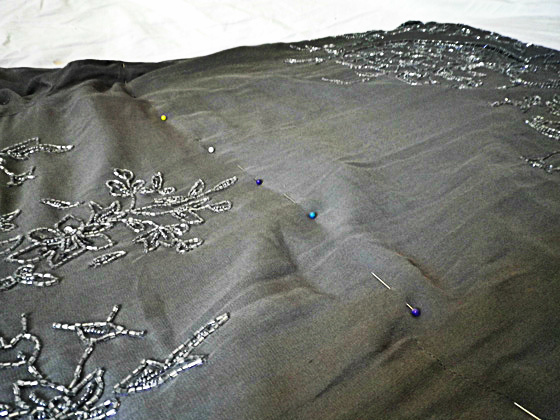 🙂 While I was making it, I felt that excitement that I haven’t felt in a long time during sewing. You know, that feeling when you can see something you are working on taking shape, and you haven’t eaten for 5 hours, because you just don’t want to waste time on that instead of getting to the point where you can try it on for the first time. And you try it on. And you realise that even though you will probably only wear it a handful of times, whenever you look at it you will still be happy that you have created something you find beautiful. Never choose a fabric with a pattern that runs in lines. 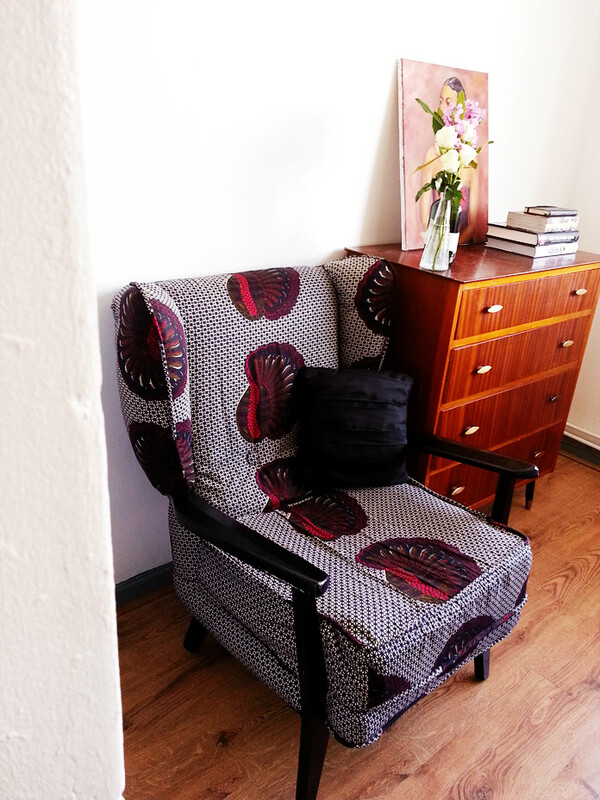 I had 6 meters of fabric and almost ran out of it, as I had to match the patterns everywhere on the chair. It really was a nightmare, but looking at it now, the hard work paid off. If you don’t have a high pressure stapler gun I suggest you use a good old hammer and upholstery tacks. 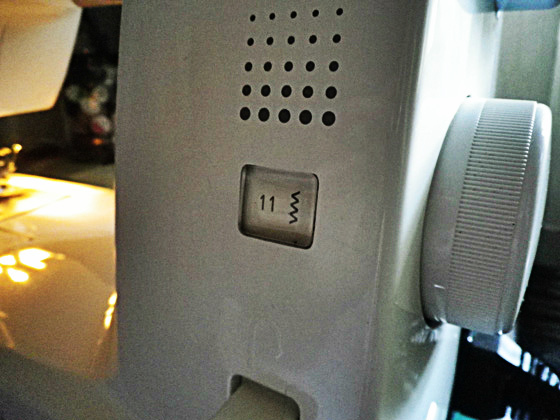 I did it this way, because this is how it was originally done and I couldn’t find my stapler. Although at some places it was hard to reach the nails with the hammer, they held the fabric in place much stronger than the staples could have. 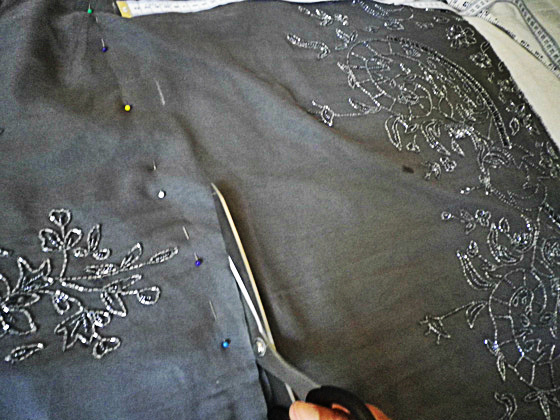 Upholstery is probably more time consuming than would imagine, but it isn’t as difficult as it seems to be. You need common sense and tons of patience. I threw away the old cover without tracing it for the new pattern (I didn’t feel like touching it ever again, as it was wet and smelly when I found the chair), and still managed to pin together the new cover on the chair. Luckily I did not have to buy new foam for the seat cushion, as we had one lying around at home, the fabric was only £10, I also bought some piping for about £2 and then some rope in a similar width. 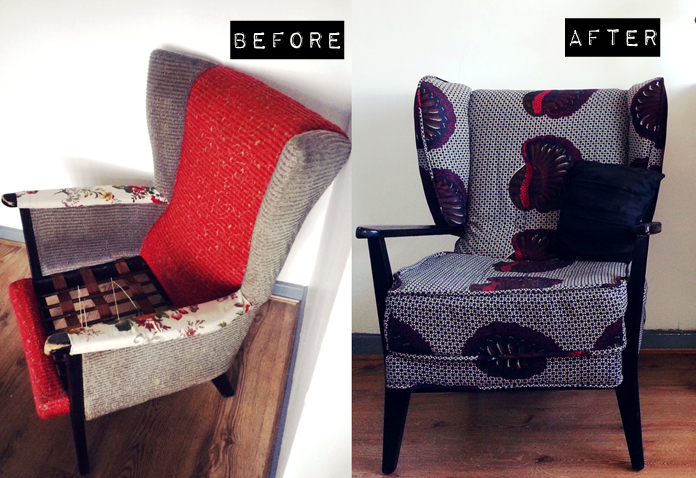 I did not buy any buttons, but covered two regular ones with the same fabric myself, so while a similar, one-off, handmade chair usually costs anything between £300 to £1500 on eBay, Etsy or Anthropology, costed me no more than £20. Yeey! Take a look at the before and after! …by the way, that beautiful painting was a parting gift from an old colleague/new friend of mine, Regina, when I moved to London. She used to paint when she was younger, and apparently picked it up again, as one day I showed her a picture on Apartment Therapy of a portrait on the wall in somebody’s living room, and told her that it was the kind of painting I would love to own, so she painted an exact similar one secretly and gave it to me as a parting gift when I left the company where we worked together. It is still one of the most cherished things I am lucky to own. Check out how I found this chair and what inspired me in this previous post. 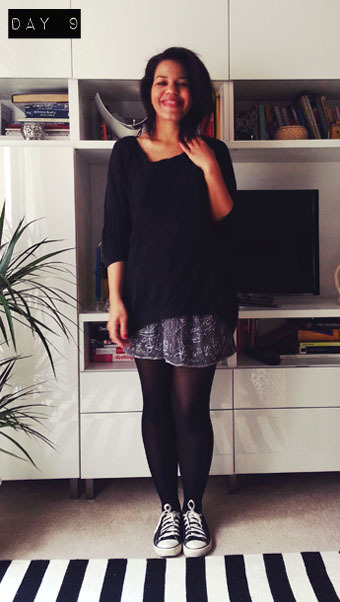 Do you remember this dress I bought a few weeks ago at a thrift store for about £3? Even though it was about 2 sizes larger and I could not picture it on myself at all, I decided to bring it home with me. 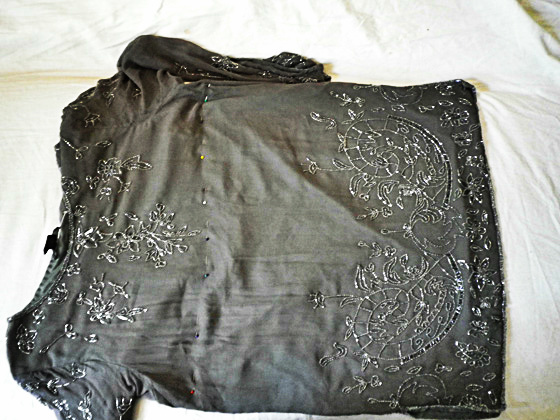 It wasn’t only because it was really cheap, but I have tried to sew sequins and beads on garments before and so I knew what a gift it is to have a piece of fabric that is 100% silk and full of hand sewn beads in the fabric pile, just in case. 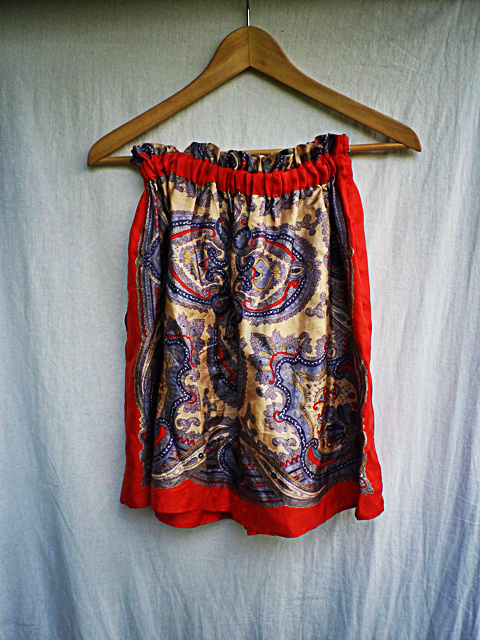 I bought it on the same day as the Zara skirt and I liked how that one looked cool because of its simple design (an elastic band on the waist)- and chic because of the silk scarf print. I thought this could might as well work on this dress if I cut it in half, so that’s what I did. It was simple as that. 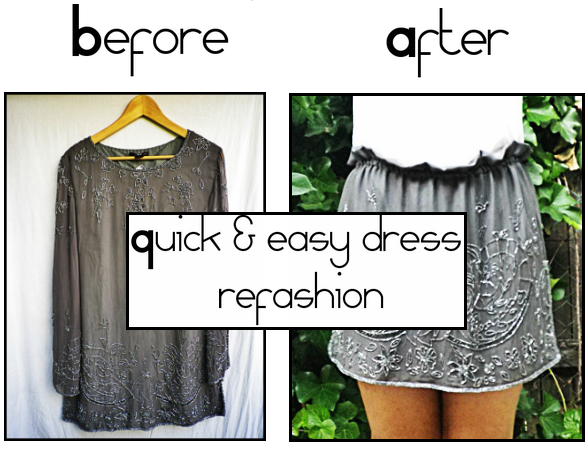 Okay, maybe not just that simple, but I only made one mistake and could correct it after 20 minutes wasted right away, so instead of long instructions, here is the recipe for successfully turning a dress into a skirt in no time! 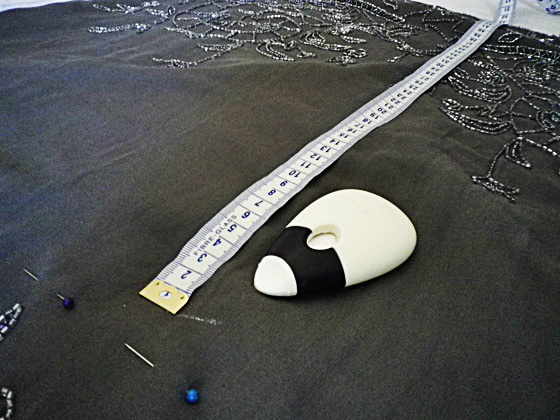 Measure the length of your new skirt (add at least 5 centimeters on top of the desired length). 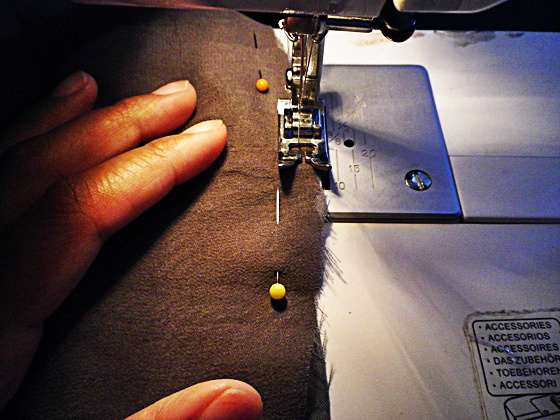 Switch your sewing machine to zigzag stitch and neaten the raw edges. 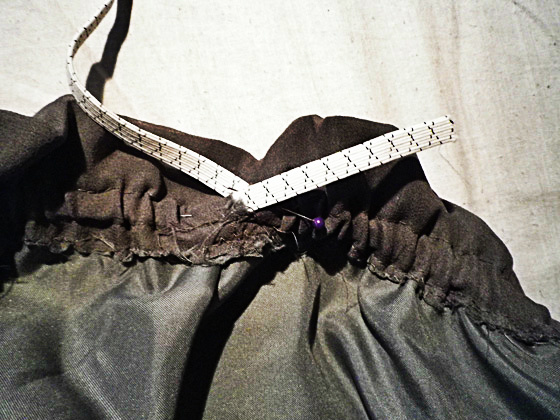 Decide how long you want the frill on top of the skirt to be, then mark this and pin it down, inside out. Stitch the top seam (mine is 3 cm from the top). Put the elastic band below the first seam. 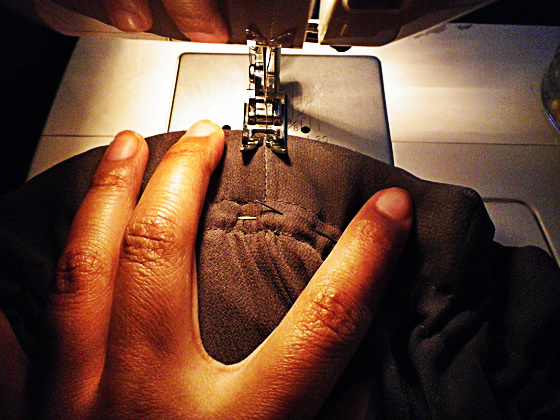 Hold it there as close as you can, secure the ends with pins and sew below it. Try on the skirt pulling the elastic to the right fit. Secure this with a pin and take the skirt off carefully. 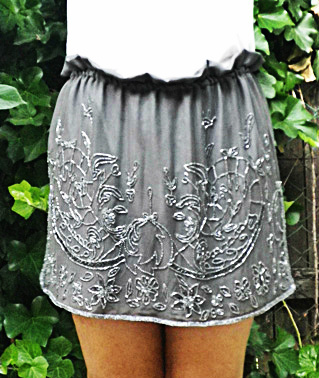 Stitch the ends of the elastic bands to the skirt and clear the inside of the skirt up. Click on the photos to enlarge them! The inspiration for it all. The casing for the elastic waistband on the Zara skirt. 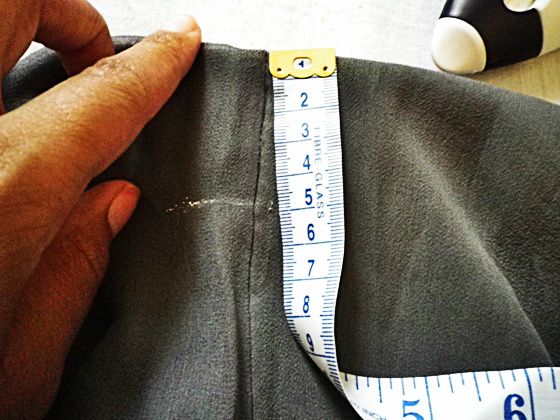 Step 1: Measure the length of your new skirt. Remember to add at least 5 centimetres on top of the desired length. Step 2: Mark it on the dress. 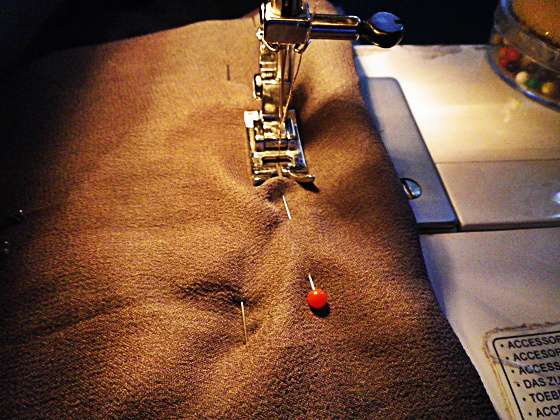 Step 3: Switch your sewing machine to zigzag stitch first and neaten the raw edges. The dress had a lining, so I pinned the two layer together before sewing. Step 5: Stitch the upper seam. 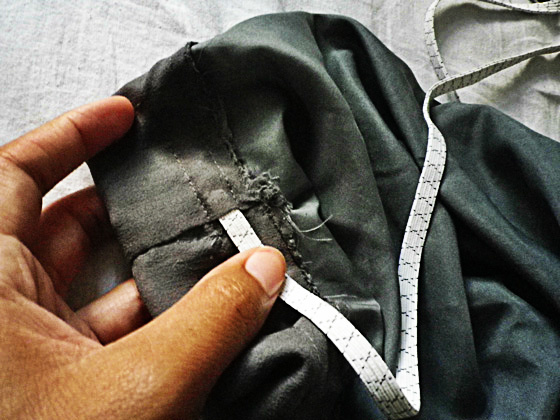 The elastic band goes right below the first seam, in between the two sides of the fabric. Secure the ends of the elastic band before making the second seam. Step 6: Finish the casing for the elastic band with the second seam. Step 7: See how it fits best and secure the ends of the elastic band with pins. 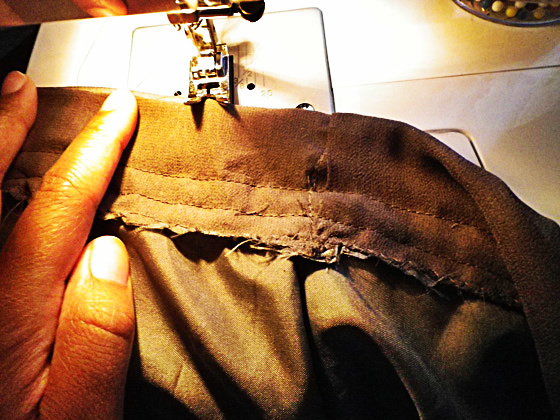 Step 8: Sew it from the outside so that you stay in the line of the original side seam of the skirt. Remember to cut once, measure twice(! 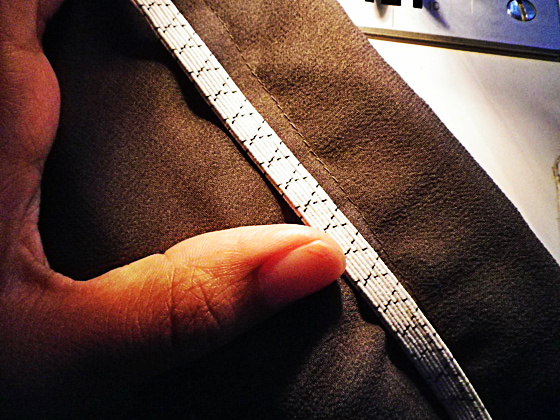 ), but do not worry too much as it will be hard to spot the length differences since it isn’t supposed to be staying straight on your waist anyway. The mistake I made was making the casing for the waistband before I inserted it. 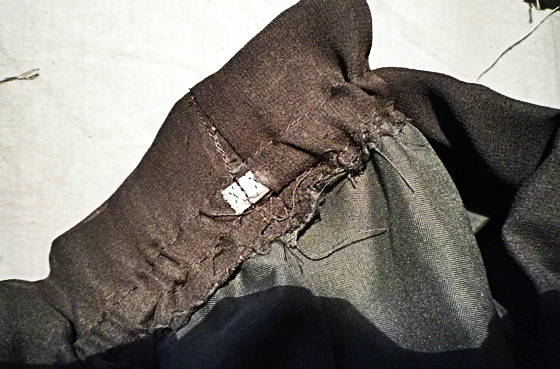 The casing was just big enough to put it in on the first few centimetres but I could not find a way to pull it through the whole skirt, so after half an hour of intense suffering I gave up on it, acknowledged my mistake, patted myself on the shoulder and well…ripped the second seam out. Despite this tiny little failure, this skirt is still one of the cheapest/easiest/best looking projects as of yet, so good luck for anyone thinking about giving it a try!